They’ve got them for smokers, Girl Scouts and ripped jeans. So why not a patch for weight loss? "I'd say the Chugay Tongue Patch is a daily reminder of how just because your physician has an M.D. behind their name it doesn't mean they're bright," obesity Dr. Yoni Freedhoff told the Sun Sentinel. "That a physician believes that 'doing no harm' involves promoting physical discomfort as the key to helping inspire long-term behavioral change in patients is truly depressing, both for his patients and for the profession." I think I’d rather just hire a friend to pinch me every time I try to eat cake. What do you think? 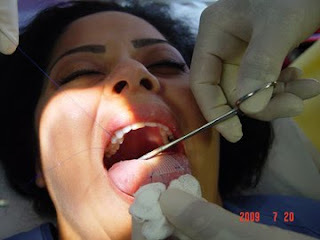 Would you want wire mesh surgically applied to your tongue? This entry was posted by kate, on Thursday, September 24, 2009. You can leave your response .